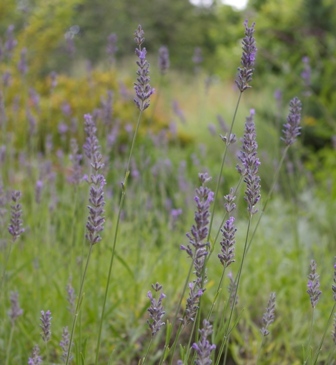 Joy Creek Photo Archive (c) all rights reserved Lavandula 'Spike' is one of the earliest intermediate types of lavender used in the perfume trade in the USA. It is very vigorous and upright with gray new foliage greening as it ages. The tall flower stems produce 3-to-4-inch spikes of violet blue flowers. Pleasing but not pungent aroma. July to August. 28 in. x 28 in. This is a Lavandula x intermedia form obtained by crossing L. angustifolia ssp. angustifolia and L. latifolia. Lavenders need full sun and very good drainage. Because of our rainy winters, we amend our soil with 1/4 ten gravel and top dress with the same to keep plant stems and foliage from resting on wet soil.